English menu available. Can prepare meals for vegetarians. 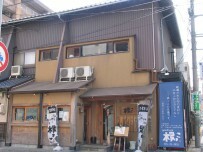 Teien-saryo is part of Minamikan, one of Matsue’s most famous ryokans (Japanese inn). They serve a variety of sets including the traditional Japanese full course Kaiseki. Dishes include fresh seafood and seasonal ingredients. The interior is all in traditional Japanese style, and you enjoy a course at a table or try the ‘Counter Kaiseki’, and watch the chef make your dishes right in front of you.